Good afternoon, crafting friends! This is my first official week designing for Melanie Muenchinger!!! Woo hoo! 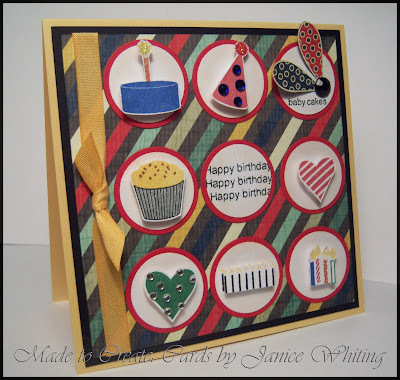 I will be showcasing Melanie's newest GinaK Designs rubber stamp set, "Candles on your Cake!" 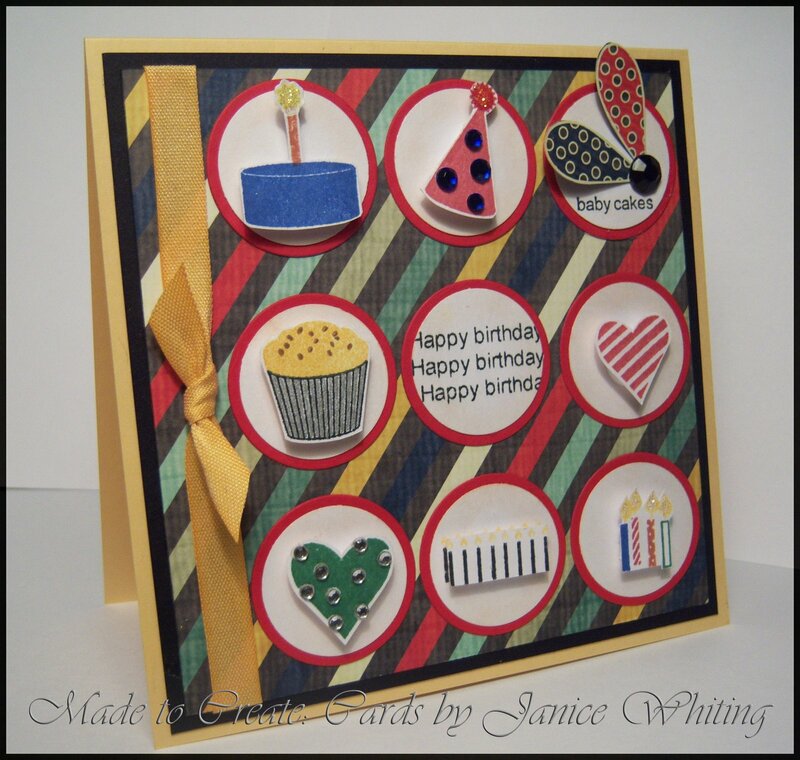 It is a darling set that is just perfect for any type of birthday card or project. 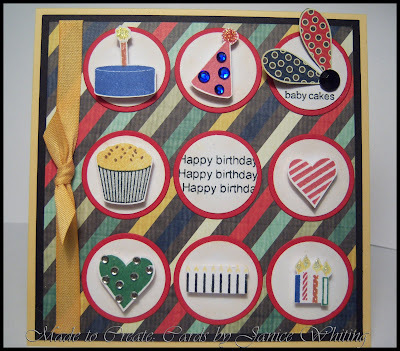 The sentiments on this set are so versatile, offering lots of variation to the type of birthday card or project you make. 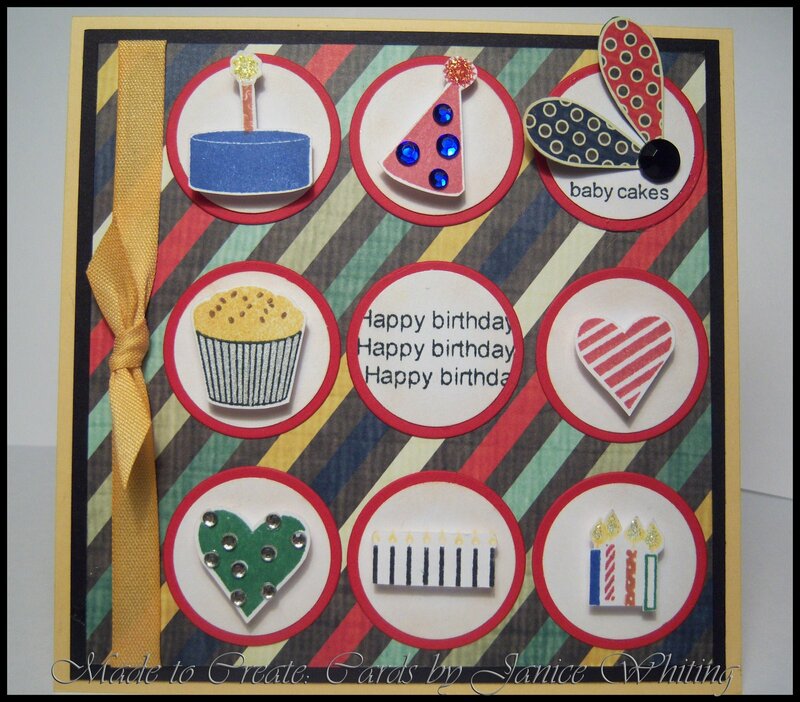 You can even use the set for other celebration cards or projects as you will see in these next few weeks! ;0) Make sure you check out her blog to see more beautiful projects as well as another card I made for my sweet 2 yr old to be, Judah! Here below is the card I'm showcasing this week. I took a few (yes, these are just "a few" of the many cute stamps in this set!) of Melanie's images and placed them individually in the circle pattern. Aren't those images adorable?! I basically stamped them and cut them out leaving just a millimeter or so of white space around them. I adhered them to the circles using pop dots. I used some designer paper I bought in Gatlinburg, Tn while on vacation (my husband so graciously took me to the local scrapbooking store and watched the boys in their playroom while I excitedly shopped--he's so great!). The paper is by Dream Street papers, Mod Posy-Statice. The card stock is none other than Pure Luxury Card Stock in Sweet Corn and Black Onyx. If you have never tried any of GinaK's PL card stock, you need to!!! It is such great quality, meaning it has a really nice weight to it. Try one of her assorment packs for starters (really affordable!) and you'll never go back to the other stuff again! oh that is adorable! I love how many of the elements you used and the sketch! What a fun and happy card! So much going on yet you keep it all together...beautiful!